A 12 day expedition to the Glaisnock Wilderness Area. Funded by an FMC Expedition Scholarship the team set out across Lake Te Anau by boat to the mouth of the Worsley Arm and traveled up the Castle hoping to find ac crossing from the head into the Dark River climbing Barrier Peak on the way. However, bad weather prevented the completion of the crossing, and after a successful climb of Barrier Peak the team retreated back down the Castle. From near the mouth of the Worsley, the team then went up Saints Creek and crossed along the tops into the Glaisnock, climbing Pt 1785 m ("The Honeycracker), 1709m and Mt Kane on the way. Day 1: We took a boat across to Worsley Arm and traveled up to the Worsley-Castle junction. Day 2: We travelled 2/3 of the way up the Castle to persistent rain. Day 3: We moved camp to the head of the Castle and spent the afternoon scouting a route through the bluffs for a possible crossing into the Dark. Day 4: We followed the route scouted the day before with the intention to climb Barrier Peak and completed three pitches to gain easier ground, but a quickly approaching front led to abortion of the summit attempt. Spent the afternoon making the camp storm proof. Day 5: Tents were only let to shuttle food between tents and to use the facilities. Day 6: The weather in the morning looked promising, so we packed up and set out full of hope to cross into the Dark today. However, drizzle set in as soon as we left camp, which wouldn't clear all day. So we retreated back down and set our tents back up. Day 7: Thick fog in the morning dampens the mood, but we forge ahead regardless -this time with day packs- and make our way towards the bluffs to wait a couple of hours for it to clear. Impatience made us start the first pitch still engulfed in fog, but we were soon rewarded with warming sun rays. The summit is reached at 6 pm, the view obscured by clouds, followed by a race back down to reach the ever so familiar base camp with fading daylight. Day 8: Now running out of time, we said goodbye to the original plan to cross into the Dark and traveled back down the Castle to the junction with the Worsley. It's drizzling at the head of the Castle. Day 9: We decided to regard the last 8 days as a separate trip and focus the remainder of our energy on a 4 day trip in the Franklin Mountains: Travel up Saints Creek and cross the tops into the Glaisnock. Saints Creek was reached early that day to leave enough time for swimming! Day 10: We moved camp to "Turtle Lake" and climbed Pt 1785 m ("The Honeycracker"). Day 11: We climbed Pt 1709m and Mt Kane followed by a traverse of the tops south of Mt Kane to our campsite above the Glaisnock. 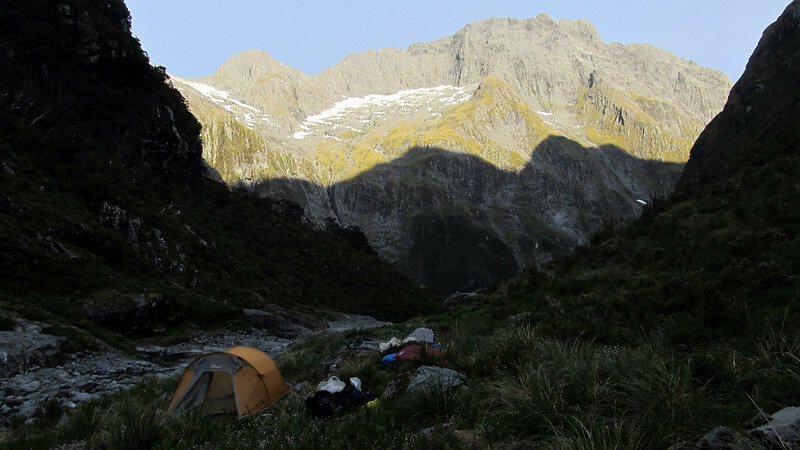 Day 12: We descended to Glaisnock Hut and spent the afternoon killing sandflies. Team: Alexis Belton, George O'Sullivan, James Thornton, Max Olsen, Tom McKellar and Nina Dickerhof. Base Camp at the head of the Caste, view of Castle Mount.